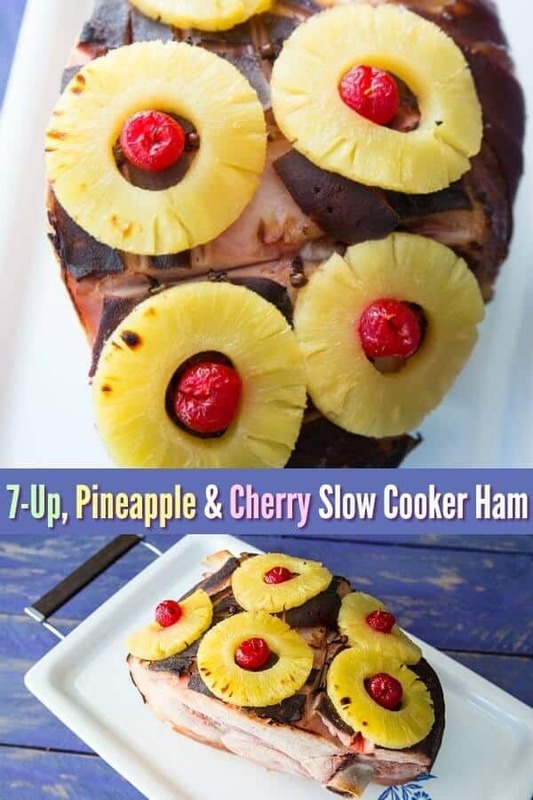 I have been wanting to make a Retro 7-Up, Pineapple & Cherry Slow Cooker Ham for ages now and now that Easter is coming I finally stopped procrastinating. 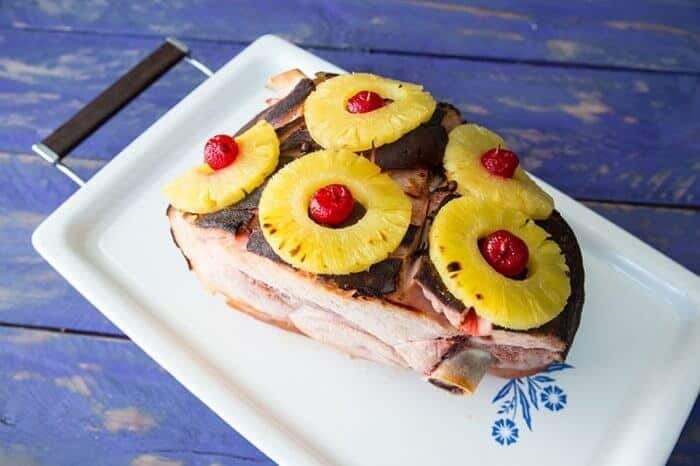 This is totally the most retro ham that you can get : pineapple, maraschino cherries and 7-Up! Now while our Mom’s used to cook it in the oven, I decided that I wanted slow cooker ham. Making slow cooker ham frees up the oven to make turkey. Laugh all you want, but I can’t have the only family that needs a ham AND a turkey for holiday dinners, am I?! It might be because we are Ukrainian and our feasts aren’t large enough until the tables are groaning under the weight of too much food, the legs are threatening to give out at any second. It might also be that we do have 13 of us now to feed and one of those is a teenage boy that can out-eat his Uncle. It definitely is because we love leftovers. My Mom and I plan for leftovers the next day, so we cook once and eat two or three times, that’s out family motto! How long do I cook a ham in the crockpot? Cooking the ham depends on how big the ham is. 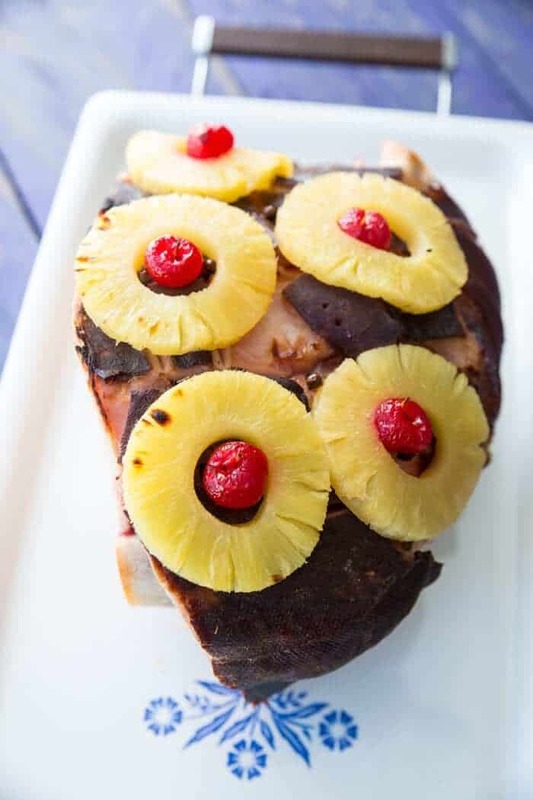 This ham took 4 1/2 hours to heat up – remember, the hams are usually pre-cooked and we are just heating them up. It also depends on your slow cooker, a lot of them can run hotter than others do. That’s all about getting to know your slow cooker and how it heats however. When you have one that runs hot, you know! Can I out a frozen ham in the slow cooker? You can cook anything from frozen in the crockpot on LOW setting, you just have to factor in the extra time that it takes to defrost the ham. The other part is that you can’t score the top of the ham until it’s defrosted, but you can do this in the middle of the cooking process. What temperature do I heat ham to? The tinfoil on top is my greatest slow cooker hack that I have been doing for years, and I always get asked about it every time that someone sees it in a video. There are very few recipes that don’t benefit from sealing in the moisture and not allowing it to escape. 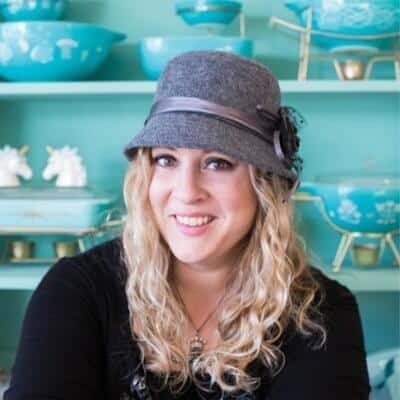 The only one that I can think of where you wouldn’t want the moisture in the crockpot is a Crockpot Chocolate Lava Cake. You actually want to get rid of the moisture in that recipe. 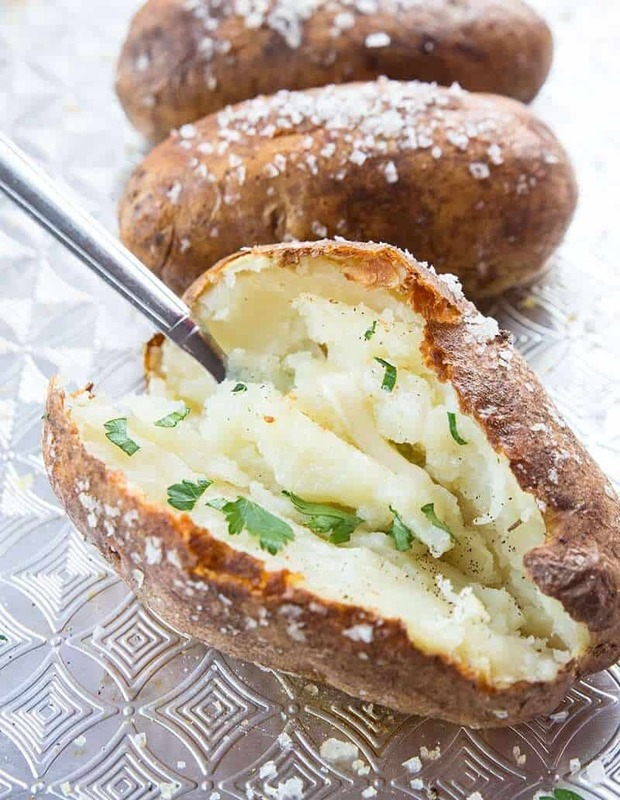 To get that gorgeous crispy top all you need to do is a quick broil in the oven at the end of the cooking time. Five minutes and you have crispy ham! 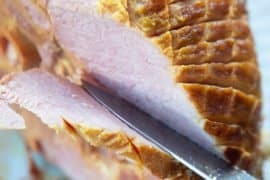 You can open up the slow cooker and baste the ham if you want, it does affect the cooking time slightly, but if you want to baste it just factor in another 15 minutes of cooking time for every time you open it. Sometimes it doesn’t affect it, but plan for the worst case scenario. Cooking the ham in the slow cooker honestly makes this the juiciest ham ever, just take a look at it in the video! Happy cooking! 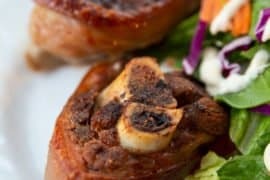 Who else loves a good retro ham recipe? This has to be one of my favourites! If you have any questions, leave them in the comments below and I will get back to you! 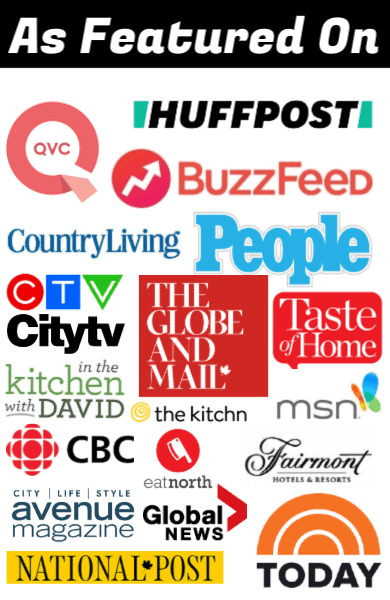 Pin This To Your Slow Cooker Recipes Board or Your Holiday Recipes Board! This is really gorgeous! Perfect for any occasion! You can never go wrong with slow cooker! 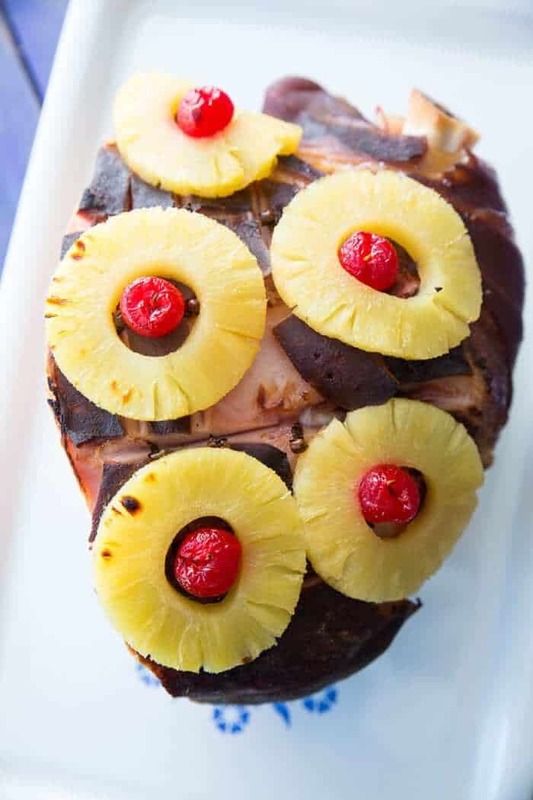 This ham would be a show-stopper at any Easter dinner! So festive! Love that this is made in a slow cooker! Holiday cooking always stresses me out with timing everything for the oven…..problem solved! What a fun way to bring a bit of nostalgia to the holiday! Looks delicious! 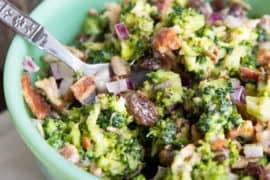 This recipe takes me back! Love that you brought it back! I like the tip about sticking it under the broiler for a few minutes to get it a little crispy! Wow, this brings me way back to childhood. Love it.